ZT Online might be a worst case scenario, but it's representative of how and why a bad game might be a good business. Ideally, bad games would be swept away by better ones that could provide gamers with real fun and rewards, but that's not necessarily what occurs. ZT Online, after all, emerged into a competitive market and quickly drew players from more traditional MMOGs. People abandoned other games for what they found in ZT Online. 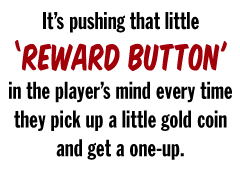 We are all vulnerable to misjudgment when it comes to evaluating a game and its rewards. As Blow and Johnson have both pointed out, game designers have a narrow metric for gauging the success of a design: do people keep playing, and do they say they are having fun? That is probably how a lot of us judge our feelings toward a game. However, those questions assume that we are able to assess our enjoyment accurately, and that's where we get into trouble. Blow cites the latest entries in the Mario franchise as examples of how reward mechanics can obscure how intrinsically interesting a game actually is. For him, coins, extra lives, and many other trappings of the classic Mario game no longer serve much purpose beyond convincing players they are having more fun than they actually are. Blow suspects that the games would not hold up as well if you stripped out these elements, and that is the problem. If the game is not so intrinsically rewarding to players that they can enjoy it without these meaningless and outmoded collection mechanics, is it really that much fun? He explains, "The core value proposition of that game, without that reward structure around lives, isn't valuable enough to people to sustain their time playing the game. So what's happening is that the reward system is being used to get players to play much further through the game than they normally would."